June | 2018 | Mike Lamberti, From Margate To Cleveland, And Back ! 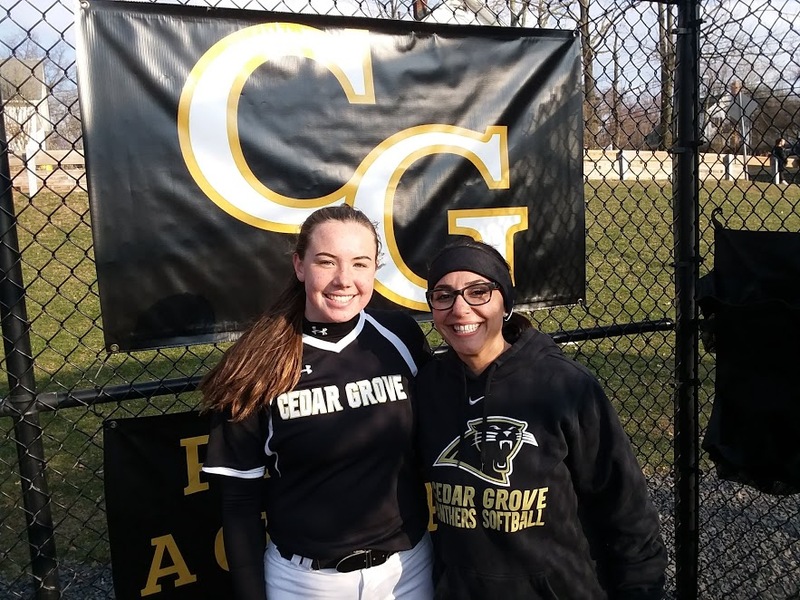 Over the past four years, Cedar Grove High’s softball team captured three state sectional titles, a pair of Group 1 championships as well as a Super Essex Conference and Essex County Tournament crown. A number of talented seniors helped the Panthers to perhaps the greatest run in the program’s history. 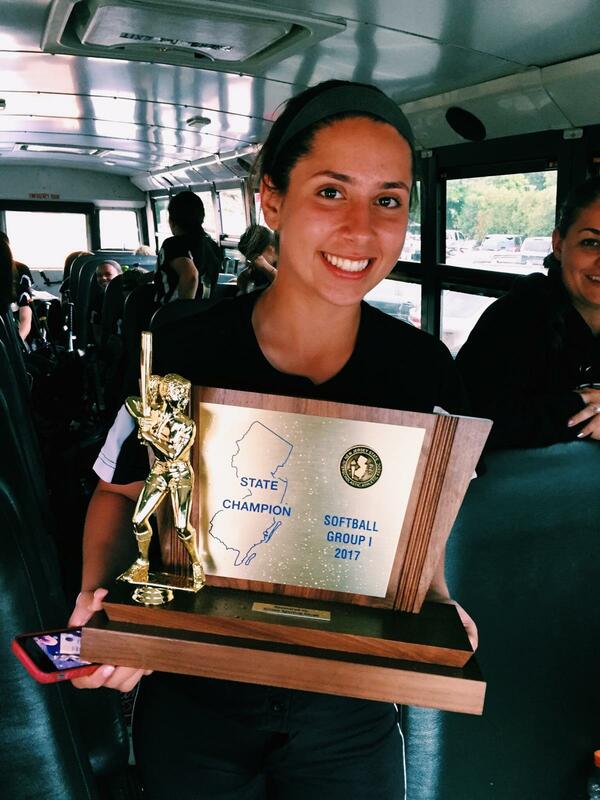 It seemed like yesterday when a freshman pitcher named Kelly Toomey starred in the circle, as the Panthers won its first Group 1 championship in 36 years. Kelly Toomey, here with head coach Nicole Velardi, had a spectacular 4-year career at Cedar Grove. Toomey had a tremendous season in 2018, both in the circle, the field and at the plate. Toomey, who is also a standout in the classroom, will attend the University of North Carolina in Wilmington this fall. What more can you say about Ava Fernandez? 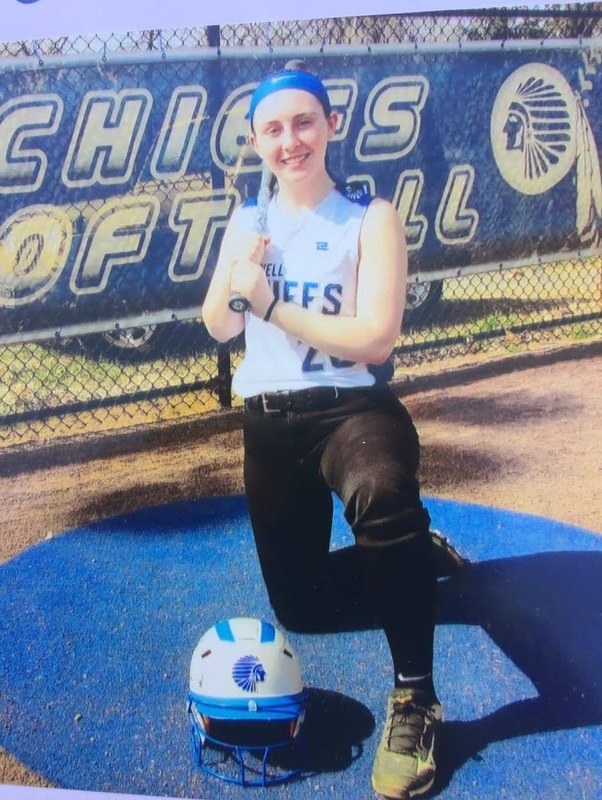 Another marvelous player over four years, Ava, who will play at Springfield College stating this fall, was a stud at the plate, and in the field. Holding championship hardware became a routine occurrence for Cedar Grove’s Ava Fernandez, along with her senior teammates. The Panthers were also led by seniors Ava Mandala, Micaela Kennedy and Kali McCabe. 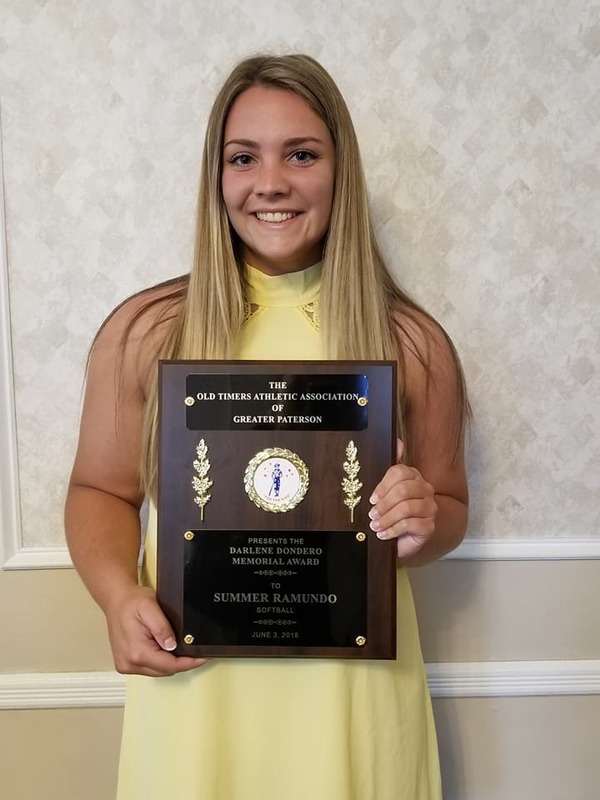 Mandala and McCabe will be attending Rowan University this fall while Kennedy will enroll at the University of Connecticut. Cedar Grove finished 25-6 this year, winning a state sectional title for the second straight year and third time in the past four seasons. There were so many good games this year in NJ high school softball. 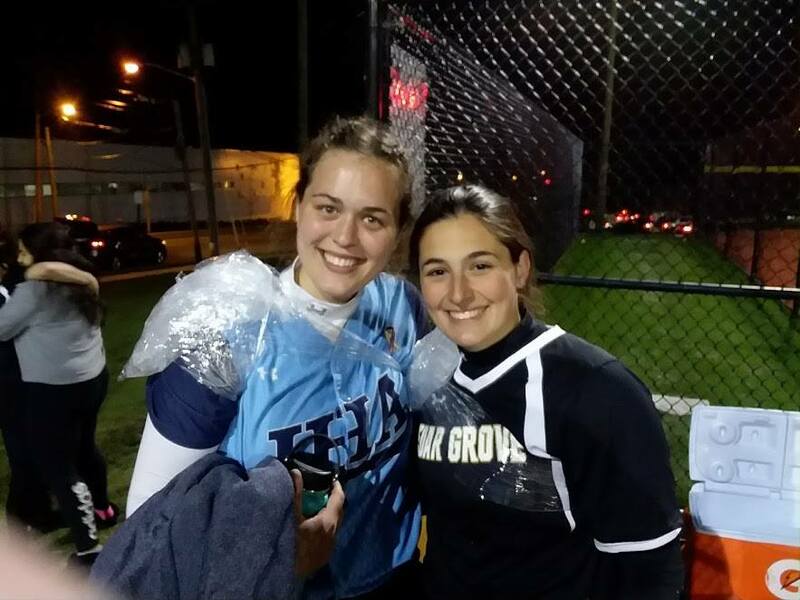 One of the best I saw came on April 22, at the Black and Gold Tournament, as Cedar Grove and Immaculate Heart Academy put on a show, with IHA winning, 2-0, in 10 innings. Both Mia Faieta of Cedar Grove (AKA California Chrome) and IHA’s Ryleigh White were outstanding in the circle, putting up some ridiculous numbers. 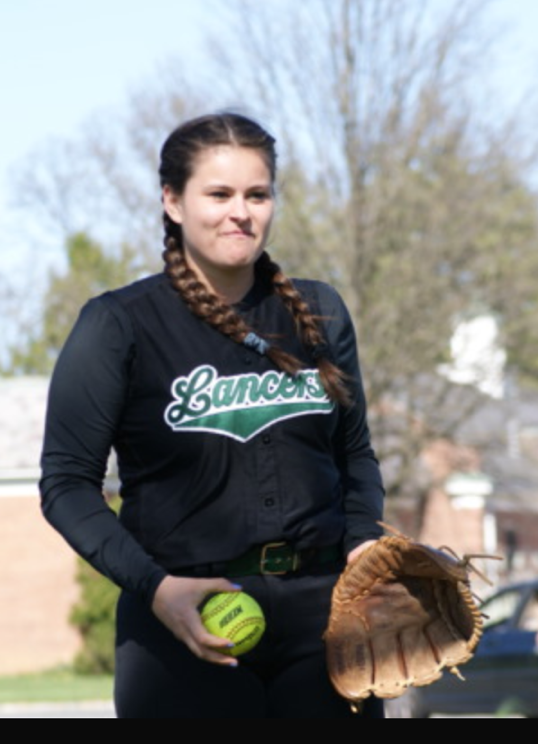 Faieta, a junior, would strike out eight of the first nine batters she faced and finished with 18 strikeouts in 9 1/3 innings of work, while giving up four hits (three of which came in the top of the 10th), walking six and hitting a batter. White, dubbed ‘Citation‘, is a close friend of Faieta’s, since the two play on a club team together. She struck out her 20th batter in the bottom of the 10th inning to end the game. Mount St. Dominic had a tremendous run in the state tournament, winning a North Non-Public A title for the first time since 2014, then playing a hard-fought game against St. John Vianney, before losing a 2-1 decision. As mentioned earlier, Cedar Grove won another state sectional championship. Its bid for a third state title in four years was denied by Roselle Park in the Group 1 semifinal. Roselle Park went on to win a state title and played in the Tournament of Champions. I got the chance to see Columbia play on a few occasions this spring and was really impressed with that team’s infield defense. The sophomore-dominated infield certainly gives head coach Cliff Smith a lot of optimism for the next two years. Columbia finished 16-9 this spring and the future certainly looks bright for the Cougars, led by Smith, an energetic coach who has done an excellent job in building the program. Essex County softball also had good seasons from Caldwell and Livingston. See the links below for more information. Congrats to all the teams. Summer softball is starting on the week of June 25, so get your popcorn ready ! 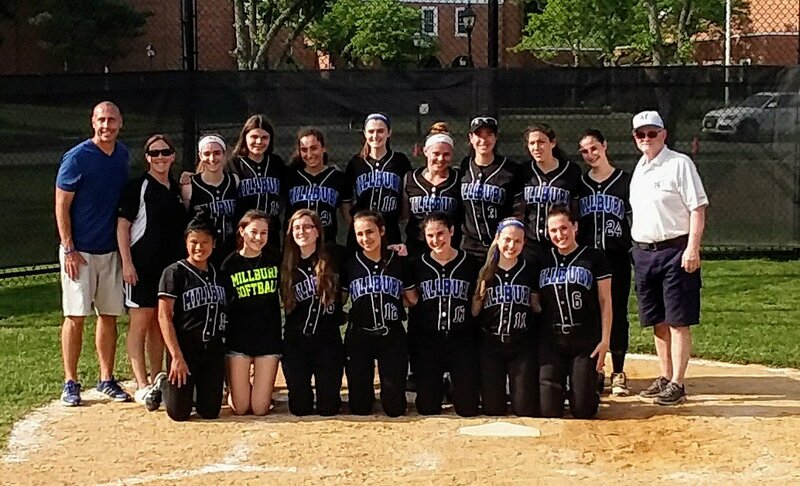 Led by head coach John Childs, Millburn put together a tremendous softball season in 2018. The Millers finished 19-9 and made a solid run in the NJSIAA Tournament, advancing to the North 2, Group 4 semifinals, before losing a 4-0 decision to North Hunterdon, which went on to win the Group 4 championship and earned an appearance in the Tournament of Champions. And to top off the season, the Millers won a Super Essex Conference (SEC) Liberty Division championship. It’s been a tremendous run for the senior class, as Millburn has put up some outstanding numbers. 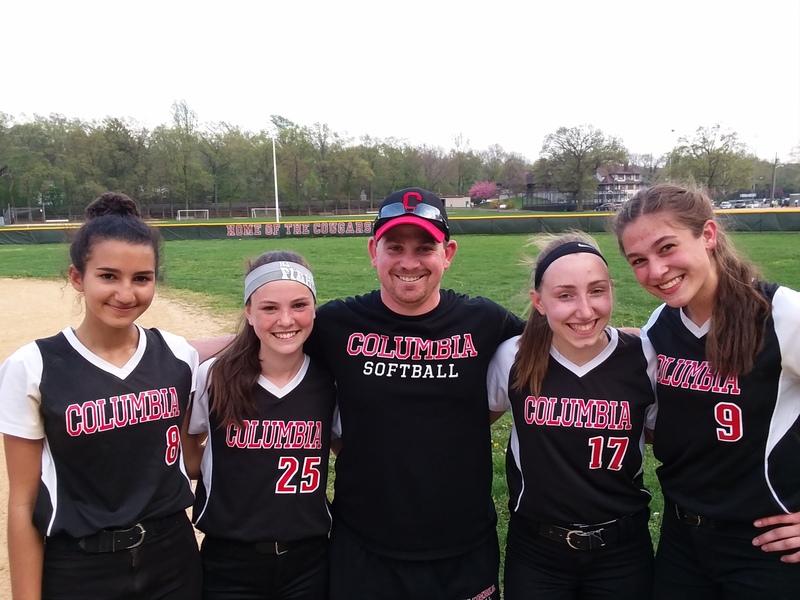 “We have never really been known a softball power, but this senior class has achieved some outstanding accomplishments over the last four years,” said Childs. Millburn won the SEC Liberty this year while taking home a pair of SEC Colonial Division crowns in 2015 and 2016. Millburn also set a team record this spring, with a fourth straight winning season. 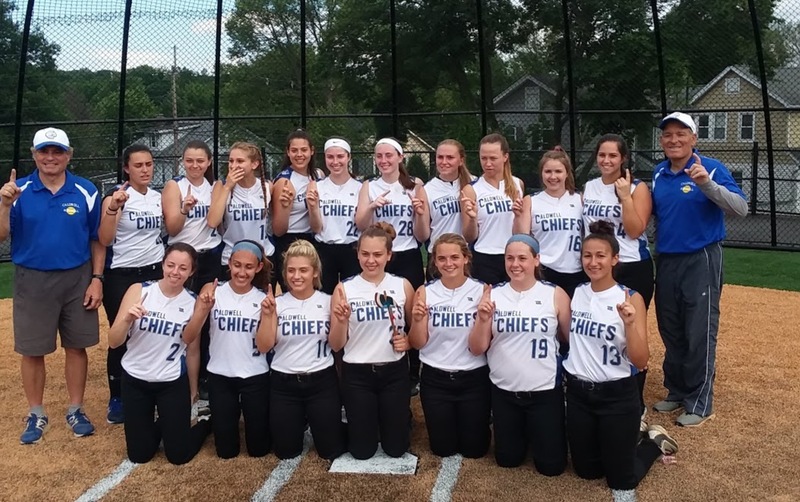 Other highlights in 2018 included the team winning the Wallkill Valley Lady Ranger Tournament, for the second time. Kaitlyn Miller, who had torn her ACL and meniscus in the second game of the 2017 season, won 18 games this spring, which broke the record for pitching wins in a season, which was 16. Helen Casey and Katy Shepard became the fifth and sixth Millers to finish their careers with 100 hits. Both players were named first team All-SEC. Casey will continue her career at Fairfield University, in Connecticut, and play on the NCAA D-1 level. She also played her final high school game at the NJ Pride Super 36 All-Star Game earlier this month. The smile on Emma Cooney’s face was always a part of her persona. Behind that smile was a burning intensity, which demanded excellence on the field, both at the plate and behind it, and included a respect for the game, of herself and her opponent. And of all the accolades from coaches, opponents and teammates, perhaps it was Emma’s dad who provided the ultimate compliment to his daughter’s character. While Mr. Cooney may be a little partial, take it from me, having known Jim for the better part of 40 years, the man throws compliments around with the ease of a manhole cover. And that includes demanding that his own children live up to the standards under which he grew up. James and his wife, Rosmeary’s work ethic was instilled into Emma at a young age, and it’s obvious with the way she played the game that there was no such thing as a day off. Cooney (left) and Ashley Reuter celebrate hits #100, along with coach Jason Daily. Emma (stud name, Charismatic) often downplayed her own successes on the softball diamond, deferring to her teammates’ accomplishments. She talks like a second coach on the field. 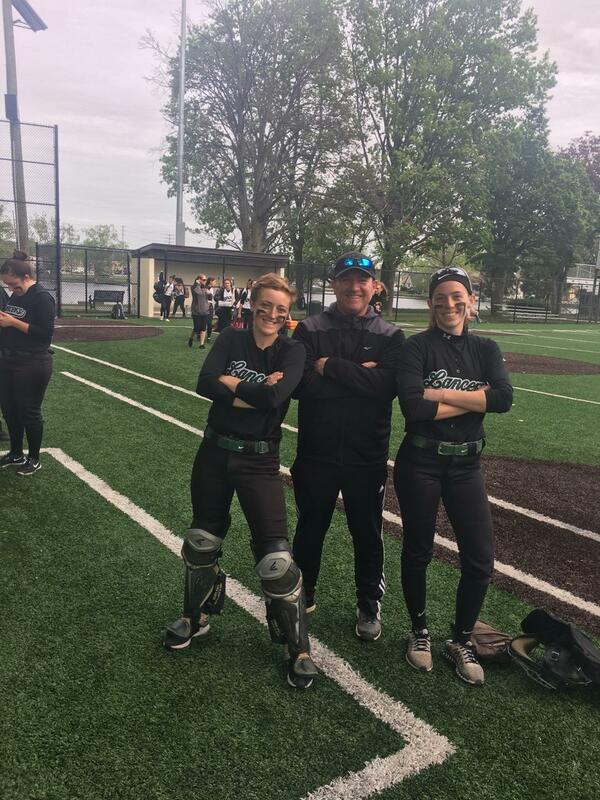 Her own coach, Jason Daily, trusted her to call the pitches, in an era where most high school coaches, or their assistants, make the calls, through the catcher. Marina Lombardi (left) here stretching with Jess Peslak before the 2013 Essex County Tournament final, was a standout catcher before Cooney arrived on the scene. Calling her own pitches was enjoyable for Cooney. “I learned from Marina, but also I call pitches a lot, in summer ball,” she said. Cooney played on a state championship team in 2016, as a sophomore, Two years later, Livingston made a serious run to another championship, losing in the sectional final, to Mt. Olive, 2-1, in 10 innings. Livingston lost that day, 8-2, at Panther Park, but Cooney did hit a homer to lead off the game. As the season went on, more and more teams preferred to intentionally walk her. 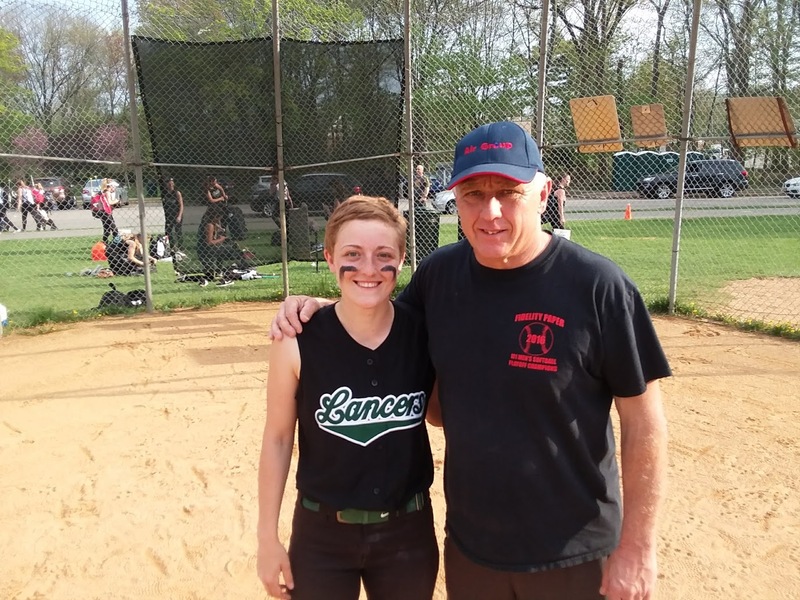 In one game against Cedar Grove, in the Essex County Tournament, she drew four straight walks, three intentionally. Cooney took it all in stride. “It’s part of the game,” she said. Nevertheless, Cooney would pick up her 100th career hit, in a state tournament game. And to make it even better, she accomplished the feat on the same day as her senior teammate, Ashley Reuter, also reached the century mark. And to make it better, they both attained number 100 in the same inning, at Bergen Tech. Cooney also spoke with pride of catching Syd ‘The Kid‘ McCormack for two years and then working with Jess Gorman, who will graduate with Cooney this spring. 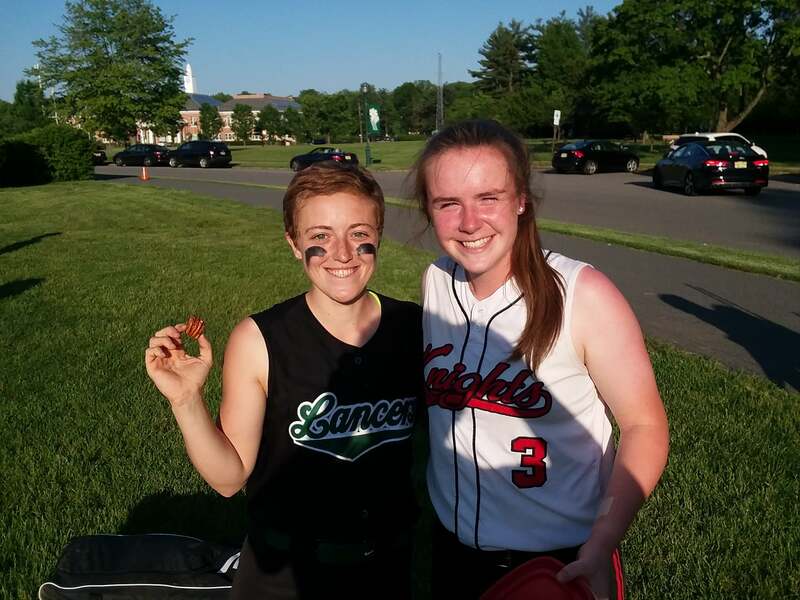 Emma’s friendships with players from other Essex County teams were also evident. Emma’s summer coach is Phil Delgado, who had a good run as Montclair’s head coach before moving on to the collegiate level. Delgado coaches the NJ Fight in the summer and fall. Emma will play college softball at William Paterson University, where Delgado is an assistant coach. Cooney plans to major in Elementary Education, with a minor in Special Education, as well as concentrating on English Literature. One thing is for sure, if Emma Cooney continues that tireless work ethic, she’ll be a marvelous success in whatever career she aspires to. At first glance, a 12-12 season might not be a memorable season for a storied softball program like DePaul High. But as head coach Sue Parler has often said, each season has a different dynamic and this year’s team certainly stepped up in a big situation, by winning a record seventh straight Passaic County Tournament championship, defeating Passaic Valley in a 3-2 thriller in early May. Earning first team, All-Conference accolades for the Spartans in 2018 were Summer Ramundo, Dominique Coiro and Laila Aponte. Second team honors went to Kaitlin Cavanagh and Gianna DiPiano while Honorable Mention was afforded to Nicole D’Ambrosia and Abby Zampese. The Passaic County Coaches named Ramundo, Coiro and Cavanagh to its first team, Aponte to the second team and DiPiano and D’Ambrosia as Honorable Mention. 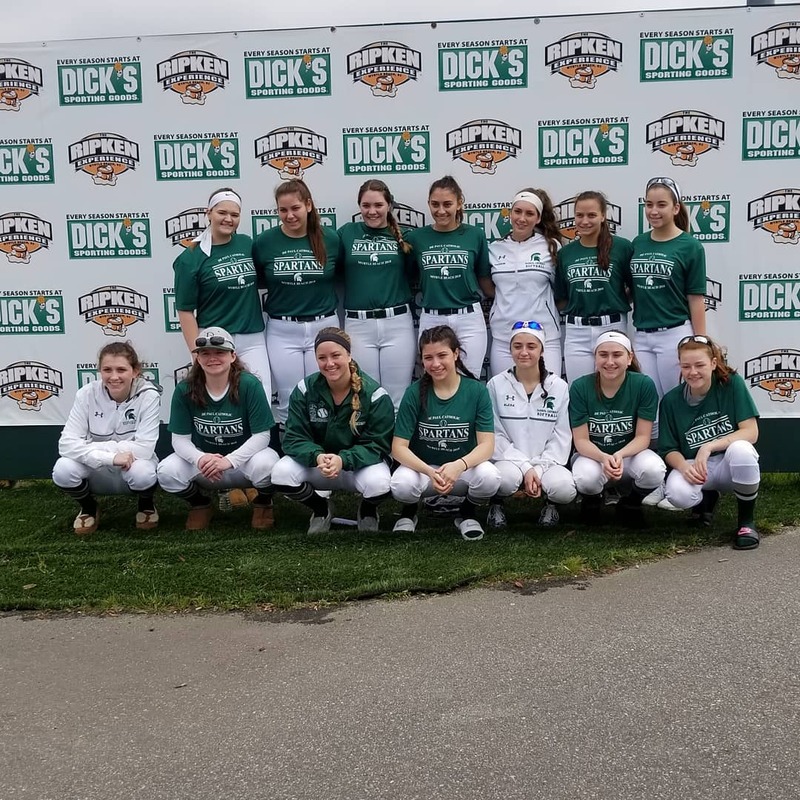 The Spartans put together a wonderful event this spring, in “Play for the Cure”, a game honoring the memory of Dominque Coiro’s mother, Josephine. DePaul edged Clifton in the emotionally charged contest, 10-9, on May 7. Proceeds from the game were earmarked for cancer research. “It’s an event we plan to continue — in fact, I have a parent who is willing to take ownership of it next year,” said Parler. Parler noted that the Spartans bade farewell to seven seniors. Coiro, Cavanagh and Ramundo were four-year letter winners. The other seniors are D’Ambrosia, Zampese, Bianca Muscato, and Kelly Nilssen. “They all will be missed,” said Parler. Among the highlights were Coiro picking up her 100th hit on May 3 and Ramundo recording her 500th strikeout, on May 23. DePaul won a record seventh straight Passaic County Tournament championship in 2018. The coach is optimistic for 2019. Upperclassmen in 2019 will also be key. Parler is already thinking toward 2019, while also thanking some very valuable seniors who were a big part of four straight county championship teams. 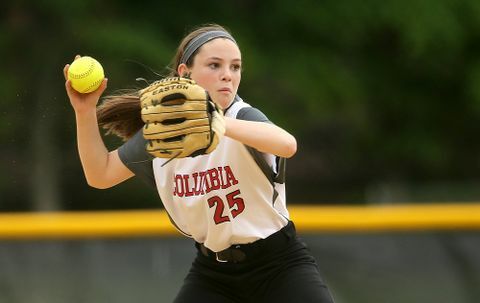 Carlie Corrigan had just pitched another solid game in a Super Essex Conference (SEC) battle, at Columbia. 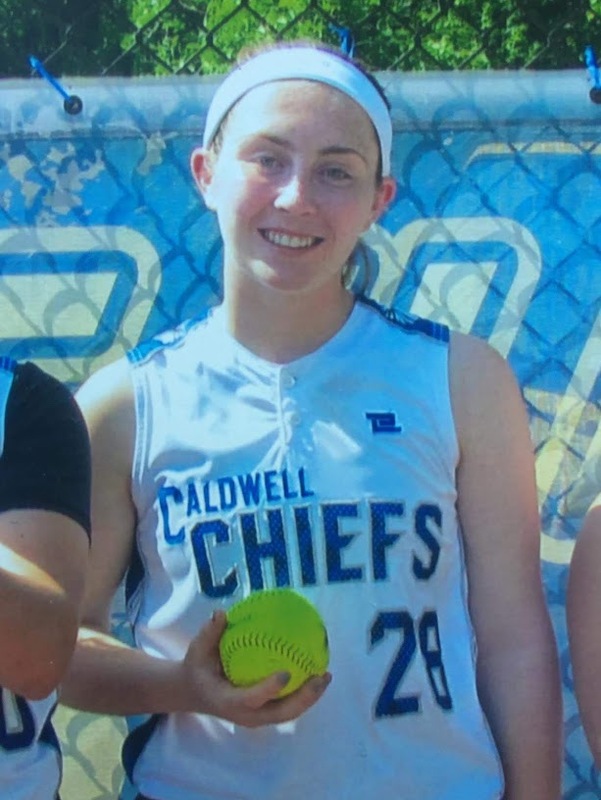 And while Caldwell finished on the short end of an exciting 3-2 game, Columbia softball coach Cliff Smith couldn’t help but compliment Corrigan’s consistency. Corrigan, a senior, turned in a tremendous season for the Chiefs, as Caldwell won an SEC Liberty Division title. Caldwell finished 17-7 this season and was 68-33 during Corrigan’s 4-year career. Corrigan and her twin sister Michaela are the daughters of Kim and Bernie Corrigan. Carlie will attend Alvernia University, in Reading, Pa., while Michaela, a cheerleader at Caldwell High, will be a freshman at Marist College this fall. Carlie will play softball at Alvernia, where she hopes to pitch. In the classroom, she will major in Occupational Therapy. Carlie has been playing softball since she was 8 years old. She started as a second baseman before taking pitching lessons. On occasion, she played second base in high school. Her pitching stats were outstanding. In 2018, Corrigan was 11-5 with a 1.21 ERA and 100 strikeouts. At the plate, she hit .357 with 18 RBI and nine doubles, Corrigan also fielded her position very well, with a .988 mark. Corrigan’s competitiveness was also evident. After being on the short end of the aforementioned 3-2 loss at Columbia, on May 18, she came in to clinch a 2-1 win over the Cougars a week later, on her home field. Corrigan then pitched a complete game as Caldwell secured a league championship by defeating Newark Academy in the season finale, on June 4. While her high school career is concluded, Carlie is excited about Caldwell’s chances in 2019.